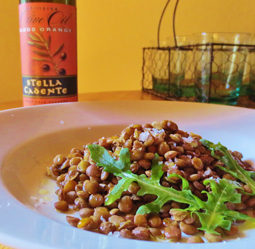 Umbrian New Year’s Lentils - A recipe from Savor California, the online showcase for extraordinary gourmet foods and beverages from California. Add juice to one cup of water in a medium saucepan. Simmer the lentils in the water for 15-20 minutes or until lentils are tender but not mushy and liquid is absorbed. Serve lentils with a drizzle of Stella Cadente Blood Orange olive oil and a sprinkling of fleur de sel. Garnish with baby arugula and citrus zest. The golden color is said to be reminiscent of gold coins and is an auspicious start to the new year.